Christians believe that history is moving towards a dramatic conclusion—that one day Jesus Christ will return in glory to judge the living and the dead. But there seem to be so many different views about how this will happen, and when it will take place. How can we make sense of it all? This short, readable book explains the liberating reality of what the Bible actually says about the return of Christ and the end of the world. Simple and clear, this book will be helpful for all Christians. Introduction: Why is it all so complicated? 1. How will the world end? 2. What will happen before Jesus comes back? 3. How will Jesus come back? 4. Will Jesus come back before or after the Millennium? 5. What will Jesus do after he comes back? 6. How should we live until Jesus comes back? 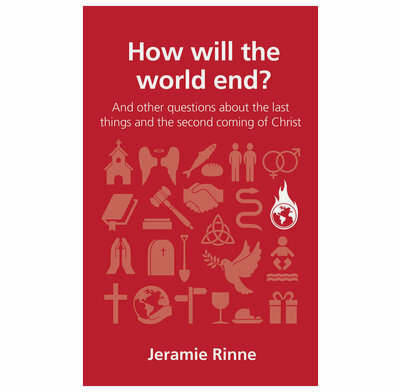 Jeramie Rinnie has written a book on the end of the world that is humble, informative and irenic. It is humble in that he doesn’t force his personal views on us; it is informative in that he helps us understand what Christians should be certain of in these discussions; and it is irenic in helping us understand the various views that arise concerning the end times over which many Christians disagree. As such, Rinnie models for us how to speak about such controversial matters among brothers. And, of course, for those who have nagging questions about the end of the world, How will the world end? will be a great resource. A great series and an excellent resource. Important issues tackled thoughtfully, carefully, thoroughly and biblically. You couldn't ask for anything more. So don't. Buy these and use them well. This was a really insightful read. The book of revelation can be tricky to handle at the best of times. This book made things click into place and my heart feels more prepared for the day Jesus returns as a result of reading it. 'How Will the World End?' is excellent. Gives a balanced overview and puts into perspective how we should think about it now. God would have us live in the here and now; not gaze endlessly into a future where we can't know the precise details now. Christ will return but there's no brownie points for predicting when. This series is very good; try one for yourself. This is a slim volume which gives a helpful resume of the key elements of the Lord's Return. It points out those ideas and theories which are not essential and should not divide Christians, while indicating those that are essential Evangelical doctrine and about which Scripture is clear. Pastor Jeramie is a solid, Christ-loving pastor. In this book, he offers a balanced perspective of the four common views on how the world will end: pre-millennial, dispensational pre-millennial, amillennial, and post-millennial. He also explores common ways in which the book of Revelation is interpreted. At the end of it all, he reminds readers that end-times theology should not divide Christians, and he concludes with the indisputable facts: Christ will return, Christ will save us from eternal torment, and we can have great joy and hope in waiting for him!